The Megaphone Helmet is a multi-functional tool to amplify your voice or instrument. It's a must-have for one man bands and people shouting on street corners. All parts are available on Amazon (for about ~$100), and with a few simple tools, you can get a hands-free megaphone. The ingredients for this recipe aren't many, but be careful that each component has the right specs. Variations and additions are encouraged, so here are the important specs behind the off-the-shelf items I bought. full-cut helmet (Amazon link) – the full-cut look can be found in skateboarding and scooter/old-school motorcycle helmets. Many different styles and colors are available, but the full-cut is important for the megaphone's stability and for the silly aesthetic of wearing a very protective helmet with no danger in sight. The matte red on this particular helmet happens to match the chosen megaphone. Be sure to choose the appropriate size. 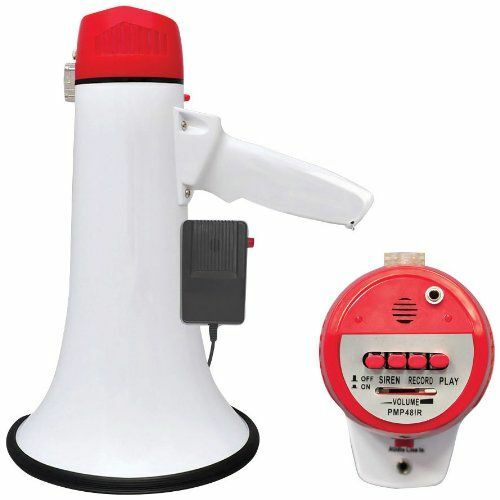 megaphone with aux-in (Amazon link) – Cheaper megaphones exist, but it's important to choose a megaphone that has a handle that can be removed, an aux-in (for the mic), and rechargeable battery (less weight). Otherwise, the helmet would require six D batteries; a heavy helmet can be dangerous for your neck. boom microphone (Amazon link) – I'm pretty sure there's one out there that's better than the one I have linked. I was looking for one with a flexible boom so that it can be moved closer to my mouth, and one where modifications to the wiring would be minimal. This has the former, but not the latter. Using a Phillips screwdriver or flathead, you can remove the handle. Luckily, the handle is just plastic, so no wires or buttons on which to perform surgery. This step is flexible depending on the tools and capabilities you have access to. If you have a 3D printer, you can print out an adapter that I designed. Solidworks and STL file attached. It has four countersunk holes to capture it to the megaphone through the same screw bosses of the handle, and it has holes to zip-tie it to the helmet. This is to prevent screwing through the thin plastic of the helmet. The zip ties aren't enough to prevent the megaphone from wiggling around. It needs something akin to a spring to always take up the slack, knowing the zip ties will loosen over time. You can use foam found in packaging, or cut up an old cork coaster, or if you buy foam tape (pictured), that would be the nicest. It's about an 1/8" of foam, with one side being adhesive. Apply the foam tape after you've tightened the screws that attach the adapter to the helmet. Find some zip ties and attach the megaphone to the helmet. Cinch with a zip tie gun or pliers. The next step is to adapt a boom microphone to a 3.5mm plug so that we can connect it to the megaphone's aux-in. The headset I chose had a proprietary connector, but almost all mics work the same way, so I knew I could adapt it. Alternatively, I could have bought a different product (at a higher price) so this rework would not have to be done. If you are adept at soldering, then this might still be difficult. First step is to remove everything but the boom mic. In the product I chose, this requires getting rid of the headset headphone. You end up with a few wires that you should cover up with shrink wrap (or electrical tape). The next step is to splice the cable at the end and attach it to a 3.5mm jack. For me, the ground wire was the shielding around the mic wire (the exposed copper wire surrounding another cable). I did not know what wire would be what (I had guesses), but the way to know for sure is to test it. Use alligator clips or have somebody hold the wires onto the two leads of a 3.5mm plug and see what works. This is crucial. You can google and ask questions all you want, but the easiest way to find out is to try. The tricky part with audio cabling this small is that it is often shielded and coated. So even though the wire is insulated with rubber, the conductor threads on the inside can be coated, making them difficult to solder. You can tell if this is the case if the solder does not wick into the conductor. I got around this in a brutish manner. I held the soldering iron to the wire and fed a lot of solder onto it, until the coating melted, and it was loosely attached to the 3.5mm plug. After all is tested, working, and ready, I would recommend shrink wrapping the exposed wire and then putting epoxy or cyanoacrylate on fragile solder joints. Then, simply epoxy or superglue the mic to the inner ear of the helmet and feed the fire through a top hole to the back of the megaphone. I need to make an alarm clock using a megaphone! Thank you for this wonderful tutorial! I am excited to make this in the near future. Since I am a progressive, guerrilla activist by nature, I imagine this device will greatly enhance my ability to protest, etc. Now, if I could only figure out to incorporate my whimpple (the headpiece and veil of my habit) into it, as well. Oh, yeah, and thanks for including amazon.com links, 3D printing files, and links to order 3D printed products with this instructable! Not too many people do that and it makes a tremendous difference! Much appreciated! Keep being creative! Can't wait to see what you come up with next!!! I wish I had this when my kids were younger, they were DEAF only to mom's voice! I fully support the act of buying a bunch of brand new stuff solely to take it apart immediately after opening to combine it all into something noticeably cooler. Excellent work sir. Hahaha, this is the best! This is awesome! What do you plan on using your megahelmet for?